Police detained five youths aged between 16 and 21 after the aggression which took place in Vitry-sur-seine, southeast of Paris. After they came in defense of their two nephews hunted down by a band of 10 youths, a 40-year-old man and his 18-year-old son were severely beaten. According to CRIF [the umbrella representative body of Jewish organisations], the aggressors shouted anti-Semitic insults. “When police arrived on the spot, the aggressors threatened the two teenagers and shouted anti-Semitic slogans,” CRIF said in a communiqué. The Jewish body said it was clear that the incident "had nothing to do with conflict between rival bands." The two wounded persons, who suffered severe bruises and an open eyebrow arch, were brought to hospital but could return home the same night. According to a police official, there is a “strong suspicion” that the attack was anti-Semitic motivated. The National Bureau of Vigilance Against Anti-Semitism, which monitors anti-Semitic incidents in France, hailed the efficiency of police and asked that the investigation reveals the aggressors’ motivation and the reality of the anti-Semitic nature of the incident. A northeastern district of Paris that is home to the French capital's biggest Jewish community has seen a rise in anti-Semitic violence in recent months. Around 600,00 Jews live in France, the largest community in western Europe. Why doesn't the media report this? "A charge of defamation brought against the Wiesenthal Centre's Director for International Relations, Dr Shimon Stanley Samuels, was dismissed October 1st, by the Paris Court of Appeal. In March 2007, a lower tribunal had sentenced Samuels to a symbolic fine of 1 euro. Dr. Samuels appealed the verdict. The charge, brought in 2006 by the Comité de Bienfaisance et de Secours aux Palestiniens (Committee for Welfare and Aid to the Palestinians - CBSP), was based on a 2004 Wiesenthal Centre report to the French Interior Ministry. Samuels' principal witness, Dr Matthew Levitt, former Assistant Secretary of Intelligence at the United States Treasury and currently Senior Researcher at the Washington Institute for Near East Policy, reported on the procedure whereby the United States had designated the CBSP as a terrorist organization – a measure also taken by Canada and Australia. - the Minister of the Interior had therefore not yet been able to proceed to an enquiry based on the elements furnished in the said Report; Considering, finally, that as Director for International Relations of the Simon Wiesenthal Centre – Europe, whose notable objective is to combat antisemitism throughout the world, Stanley Samuels disposed of elements constituting a sufficient factual basis for the contentions for which he was reproached, which, when placed in their context, i.e. to call on the Minister of the Interior to conduct an in-depth investigation of the CBSP, did not overstep the permissible limits on freedom of expression, guaranteed by domestic and international law. Considering, in consequence, that the first judges' decision is to be annulled, and Stanley Samuels is acquitted." The Wiesenthal Centre thanked its legal counsel, Advocates Thierry Levy and David Père, for their efforts – as well as the many individuals who supported Samuels - to arrive at this vindication of justice." "Around 200 tombstones and 100 monuments were desecrated Thursday in a Jewish cemetery in the south of Romania’s capital Bucharest. 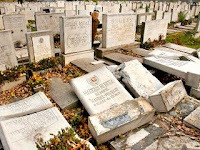 Unknown vandals have knocked over and, in some cases, destroyed the headstones in the cemetery where at least 35,000 Jews are buried, including victims of the Holocaust. It took place during the Jewish holiday of Simchat Torah. The vandals also smashed windows in the administrative offices of the cemetery. No anti-Semitic slogans were discovered on the destroyed tombstones, according to police. Jewish leaders condemned the desecration and said the scale of the destruction suggested the activity was organized — rather than random acts by wayward youths. Paul Schwartz, spokesman for Romania's Jewish community, called the desecration "the worst act of vandalism in the nation in recent times." (...)"
Romania has struggled to come to terms with its role in the Nazi extermination of Jews during WWII. It denied any participation in the Holocaust until an international commission chaired by Nobel Peace Prize laureate Elie Wiesel said in 2004 that Romanian authorities had killed up to 380,000 Jews in territories under their control. Under pro-Nazi Marshal Ian Antonescu, Romania became a German ally in 1940 but switched sides just before the war ended. Will Europe stay away from Durban II? "With the U.N. follow-up conference on racism, dubbed "Durban II," just 7 months away, pro-Israeli NGOs are leading a move to persuade major European countries to stay away. When the first anti-racism conference, held in the South African city of Durban in 2001, degenerated into a festival of unabated Israel bashing, Israel and the United States walked out. Now, concerned that the follow-up conference slated for Geneva next April, will take on a similarly anti-Israel bias, the NGOs - backed by the Israeli government and Israel's supporters in the U.S. Congress - are urging European countries not to lend the event legitimacy by attending. The agenda for Durban II is largely being shaped by Libya, the preparatory conference chairman, and the so-called "Friends of the Chairman," who include Egypt, Iran, Cuba and Pakistan. NGOs monitoring preparatory conference proceedings say the chairman and friends' work on a final statement suggests that Israel will be the only country singled out for racist practices, and that Western anti-terrorist measures will be excoriated as "Islamaphobic." The way the wind is blowing can also be gauged by the fact that "The Palestinian Grassroots Anti-Apartheid Wall Campaign," an umbrella organization dedicated to comparisons between Israel and apartheid South Africa, was accredited without debate, while some Jewish NGOs have been denied accreditation, such as the Canadian Council for Israel and Jewish Advocacy. Pro-Israel NGOs, like NGO Monitor and Eye on the U.N. are running a three-pronged campaign to lessen the impact of Durban II: Urging governments and charitable foundations not to fund its activities, calling for a wide-reaching boycott, and planning a strong pro-Israeli presence in the streets outside the conference hall. They have had some significant successes. The Canadian government and the Ford Foundation, both of which made large contributions to Durban I, are not directly funding anything related to Durban II. In the U.S., Congresswoman Ileana Ros-Lehtinen, the ranking Republican member of the House Committee on Foreign Affairs, has tabled a bill barring American funding of the Geneva event. Moreover, Canada and Israel have decided to boycott Durban II, with the U.S. and Australia likely to follow suit. The battle now is over European participation. "If Europe goes, Durban II will not be delegitimized, but if Europe stays at home, it will be exposed," says Gerald Steinberg, director of the Jerusalem-based NGO Monitor. In Steinberg's view, the French position will be key, partly because France currently holds the rotating EU presidency and partly because French President Nicolas Sarkozy may press for a boycott. Last February, Sarkozy indicated that France might stay away, declaring bluntly that it would "not allow a repetition of the excesses and abuses of 2001." Steinberg, however, notes that Sarkozy's remarks were not coordinated with the French diplomats at the Quai d'Orsay, and that, on balance, the current tendency in Paris is to attend. That is also the case in Spain, Scandinavia, Belgium and Austria. On the other hand, Eastern European countries like Poland, the Czech Republic and Slovenia favor a boycott. Italy would probably join them, according to Steinberg, while Britain and Germany remain undecided. Steinberg will brief the European Parliament in November in an attempt to persuade member countries to stay away. He says much will depend on the position the new American president takes. "The Europeans will study the recommendations of the preparatory committee, which is due to finish its work in October. Then they will wait to see what the president does, before deciding by the end of next February," says Steinberg. This time, Steinberg says, pro-Israeli groups will not leave the streets of Geneva to the Israel bashers as was the case at Durban I and he notes that one of the conference days coincides with Holocaust Memorial Day. "On that day, there will be appropriate public activities for Yom Hashoah outside the conference hall, which will highlight the contrast with the travesty going on inside," he tells The Jerusalem Report." "A culinary show on Adolf Hitler's favorite meal to be aired next week has come under fire from Jewish, resistance and political prisoner organizations. In his series "Plat Préféré," or "Favorite Dish," professional cook Jeroen Meus goes to Hitler's haunts in southern Germany to prepare trout with butter sauce, "a succulent festive meal" and said to be one of Hitler's favorite meals, the program's trailer announced. Michael Freilich, the editor of Joods Actueel magazine, leads the criticism saying Thursday it is worrying Hitler is turned into a banal figure, thus sending "the wrong signal" to a younger generation. The VRT network will air the show Oct. 28 and said it will put Hitler "in the right context."" 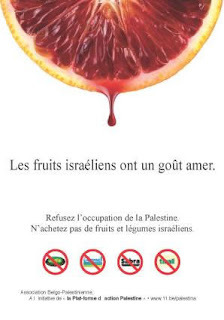 In July 2003, Oxfam Belgium produced this poster: "Israeli fruit tastes bitter. Say no to the occupation of Palestine. Don't buy any fruit from Israel." for which it eventually apologized, after an international campaign was successfully launched by the Simon Wiesenthal Centre (here and here). The poster still features prominently on the website of the Belgian-Palestinian Association, whose chairman is a former Oxfam Belgium head, Pierre Galand, who keeps the tradition very much alive. ""Unattributable Gaza Update": that is the actual title of periodic e-mail alerts sent out from Oxfam International, the UK-based NGO. The subtitle states "This document is for your information only – do not attribute to Oxfam International – check and confirm all figures before reporting." One of the e-mails that I received was signed by 'Mohammed Ali' Abu Najela "Advocacy and Media Researcher, Oxfam GB, Gaza Strip - Occupied Palestinian Territories" and the other was signed by Michael Bailey "Advocacy and Media Manager, Jerusalem Office". Now comes the interesting part: now that I have made this inquiry, I am now on the "specific distribution list" for more of these Unattributable Updates! Last I checked, I don't need this information to do MY job. So why does Oxfam think I should receive these? Given the history of deliberate misinformation and media manipulation by Palestinians and their advocates, this could be just another way that Palestinians use NGOs as part of their propaganda war. Certainly it's not like information, especially unattributable information, would ever circulate around the Internet! Unfortunately, this is not really a humorous matter. The al-Durah affair was used by Palestinians to inflame tensions and inspire heinous acts of terrorism against Israeli civilians. The so-called "Jenin massacre", the Hezbollah photo frauds unquestioningly disseminated by Reuters, and the Gaza beach incident in which the deaths of civilians from a Palestinian land mine were blamed on an Israeli attack-- all were prominently used against Israel while the "corrections", if ever acknowledged at all, were made very quietly. Just 2 months ago, there was a miracle that occurred in Gaza that received remarkably little press coverage-- a Palestinian who had died, allegedly because he was denied access to Israel for medical care according to the press release from Physicians for Human Rights in a story given prominent play on the BBC, was resurrected the next day, though I don't think the BBC felt that his resurrection was unusual enough to publicize. What if I suggested that Oxfam and other NGOs knowingly manipulate their reports to deliberately harm Israel? What if I suggested that Oxfam and other NGOs knowingly employed Hamas terrorists on the ground in Gaza; or that they were required to pay a percentage of their funds (donated by well-meaning citizens in Europe and the US) to Hamas to help fund Gazan rocket factories; or that they knowingly collaborated in allowing Hamas to limit the distribution of aid to its own loyalists? These observations aren't my own, so I can't say with absolute certainty that they are true. (...)"
Special Report: "Pierre Galand (Belgium) Using Political NGOs to Promote Demonization & Anti-Semitism in the UN & EU" (NGO Monitor, 2004). Jews and non-Jews alike - this should be emphasised - are critical of Pope Pius XII's silence during and after the war and opposed to his beatification. 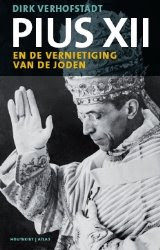 Dirk Verhofstadt, a scholar and brother of former Belgian Prime Minister Guy Verhofstadt, has just published a well researched and strongly argued book about the Pope's sad conduct during the war : Pius XII and the extermination of the Jews (Pius XII en de vernietiging van de Joden). "A spokesman for Pope Benedict XVI announced over the weekend that the Catholic leader had stopped the beatification of Pope Pius XII, an issue that has heightened tensions between the Vatican and Israel. Pope Pius, who served during World War II, has been criticized by Jews the world over for his silence in the face of the Nazi genocide during the Holocaust. Numerous Jewish groups as well as a leading Israeli rabbi expressed their opposition to recent steps toward beatification, which means making him a saint. Pope Benedict's spokesman Rev. Federico Lombardi reacted and stated that the pope had decided to study the matter further. The central umbrella organization for Jewish groups in France, the Conseil Representatif des Institutions Juives de France, warned in a statement, "Pope Pius XII, worried about burning bridges with Germany, never made a clear statement denouncing the singular monstrosity of the extermination of millions of Jews. Moreover, he did not do so after the war either, which is profoundly shocking. If carried out, the plan to beatify Pius XII, who was pope between 1939 and 1958, would deal a severe blow to relations between the Catholic Church and the Jewish world." Jewish groups in Italy and elsewhere have also urged the Vatican to reconsider the move. Amos Luzzatto, president emeritus of Italy's Jewish communities, noted in an interview published in the newspaper La Repubblica that numerous European leaders had spoken out against the deportation of Jews during the war. "I ask myself why Pius didn't do the same thing to call European Catholics to action. These are questions that haunt us Jews," he was quoted as saying. "The Vatican should know that for the Jewish world this would open up a wound that will be difficult to heal." The charges were refuted by Cardinal Tarcisio Bertone, who wrote in a pre-emptive full-page tribute to Pius XII published in the Vatican newspaper L'Osservatore Romano, "It was precisely by means of a prudent approach that Pius XII protected Jews and refugees. If he had made a public intervention, he would have endangered the lives of thousands of Jews who, upon his directive, were hidden, in 155 convents and monasteries in Rome alone."" Source: ADL report: "Anti-Semitic Conspiracy Theories Spread Globally As World Markets Grapple With Financial Crisis"
The Anti Defamation League has been reporting on "conspiracy theories linking Jews and Israel to the global financial meltdown". It compiled a snapshot of the "global anti-Semitic reaction that has emerged as a result of the ongoing financial crisis". "Anti-Semitic expressions in response to the financial crisis are spreading in European and Latin American countries, with many appearing on Web sites as articles or comments from unidentified individuals who are angry and seeking to place blame for the spreading impact of the crisis. Some are accompanied by vicious anti-Semitic caricatures and images." It is worth noting that in Spain, where anti-Jewish sentiment is among the highest in Europe (46% of Spaniards have an unvavourable opinion of Jews (compared to 9% in the U.K. and 7% in the U.S.) , remarks linking Jews to the crisis are not circumscribed to discussion forums and blogs. "Spain: Op-eds making reference to Jews and the financial crisis appeared in diario El Pais. While the articles did not directly accuse Jews of causing the crisis, the comments section following the articles contained several anti-Semitic entries. One writer declared, "The crisis is not a financial problem but an economic one … it is what is behind this gruesome scene of savage capitalism of the Zionist students of Milton Friedman." Additionally, several financial Web sites featured articles with anti-Jewish themes, including one stating that "Lehman's management board is made up of Jews who were only interested in results no matter at what price [and they always believed that another bank like Barclays, whose management board members also belong to the Jewish community, would rescue them, but this was not the case]. (Cincodias.com)." "Every book fair exhibits bestsellers. But anti-Semitic bestsellers? And in Germany, of all places? Last week at the Frankfurt Book Fair, I happened to find myself in the International Publishers section and was simply astonished. 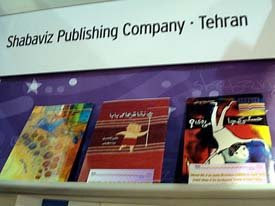 At the stand of the Iranian publishers, in plain view, was the text that influenced Hitler’s Holocaust fantasies like no other: The Protocols of the Learned Elders of Zion, published in English by the Islamic Propagation Organization of the Islamic Republic of Iran. The first page of the tract makes clear that Israel is the target of this new edition. It shows a snake made of triangles, enclosing an area labeled "Greater Israel" that includes large areas of Egypt, Syria, Lebanon, Jordan, Iraq, parts of Turkey and northern Saudi Arabia. Each triangle, according to the annotation, symbolizes the "Freemason’s Eye," supposedly a "symbol of Jewry." 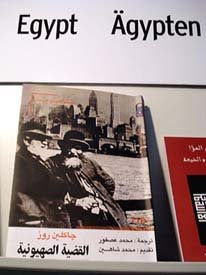 A few steps farther on, the second most important classic of modern anti-Semitism was on display: Henry Ford’s The International Jew, in a 200-page abbreviated version, published by the Iranian Department of Translation and Publication, Islamic Culture and Relations Organization. It was interesting to read the numerous footnotes that the Iranian publisher had added. For example, Salman Rushdie’s Satanic Verses is presented as the latest example of the viciousness of Jewish slanders. A third anti-Semitic screed caught my attention for its gaudy cover: A red Star of David over a gray skull and a yellow map of the world. Its title was Tale of the ‘Chosen People’ and the Legend of ‘Historical Right’, written by Mohammad Taqi Taqipour. In his foreword, the author is certain of another "final solution": Given the "global Islamic movement," Israel will soon be destroyed. 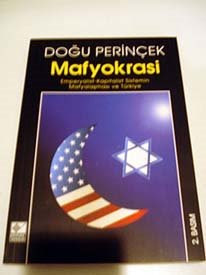 (...)"
"Anti-Semitic tracts can be found throughout the Muslim-world book stands at the Frankfurt Book Fair, including at the displays of this year's "honored guest," Turkey, according to the Simon Wiesenthal Center. According to Samuels, "the above-mentioned publishers are in violation of their contractual obligations to the Frankfurt Book Fair - among them are chronic annual recidivists."" 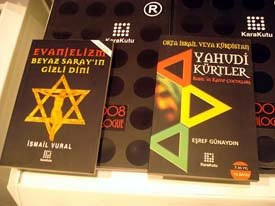 Two books: "Evangelism" as Jewish control of President Bush, and another on Jewish control of Kurdistan. Authored, respectively, by Ismail Vural and Esref Günaydin. Both published in 2007 by Karakutu, Istanbul (on Stand 5.1/C/976/78). 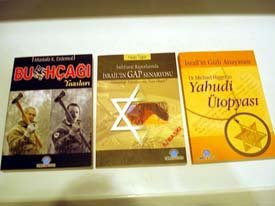 Three volumes: the first on President Bush as a latter-day Hitler, by Mustafa K. Erdomol; the second on Israeli control of Turkey, by Hassan Taplun; the third, entitled "Jewish Utopia", by "Dr Michael Higgerin". All published in 2005-2006 by Ozan, Istanbul (on Stand 5.1/C/976/45). "Mafiocracy: The Imperialist-Capitalist System of the Mafiosi and Turkey" by Dogu Perinçek. Published in 2005 by Kaynak Analiz, Istanbul (on Stand 5.1/C/976/85). 'The Question of Zion', 2005. The National Centre for Translation, Cairo (on Stand 5.0/A/931). Three children's books: 'The Tattoos on My Daddy', 'Hassani, Where Are You Going? ', 'The Birthday Party of Angel of Death' - all glorify war and encourage martyrdom, published by Shabaviz, Tehran (on Stand 3.0/J/350). Seven children's primers that extol violence and propagandize the 'Naqba' and 'Intifada' in the name of education: 'Rasha's Window' by Abia Tubasi; 'The Airplane' by Zakariya Mohammed; 'Summer 67' by Majdi Shomali; 'Kosor Ashreia' (a collection of poems); 'Travel over Travel' by Salman Natour; 'Palestinian History Book for Youth' by Sonia and Saed Nimr; 'A Little Piece of Ground' by Elizabeth Laird and Sonia Nimr. 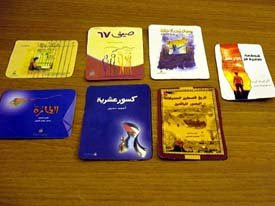 All published by the Tamer Institute for Community Education, Ramallah (on Stand 5.0/E/922). "At present, one of the biggest threats to security in Europe is terrorism. Since the 1980s, more than 90 European citizens have been killed in terror attacks committed by the terrorist organisation Hezbollah. Experts on terrorism say that Europe is at risk of a terrorist attack and I wonder why Hezbollah is only on the UK and Dutch lists of terrorist organisations and not on the EU's", said Jana Hybášková MEP at a press conference following the panel discussion with experts on the terrorist threats in Europe. "I co-sponsored a Written Declaration within the European Parliament. We mobilised parliamentarians to urge the Council and Commission to act. There is clear evidence that Hezbollah is an organisation with terrorist connections and our duty is to identify that danger. The European Union is not committing itself to the prevention and protection that its citizens expect from it. Security is a new dimension of European integration and is one of the biggest challenges in the 21st century", continued Hybášková, Chairwoman of the European Parliament's Delegation for Relations with Israel. Putting Hezbollah on the list of terrorist organisations would further disable fundraising opportunities and would freeze their financial assets located in Europe. There are approximately around 900 sleepers of Hezbollah in Germany according to some estimates. Al-Manar, Hezbollah's satellite television station, which was banned from the EU satellite network, is still spreading its terrorist propaganda to European viewers. "Terrorism is an imminent danger for Europe and it is our duty to warn citizens about its threats. I call upon the Council and the Commission to seriously deal with these threats and with those who oppose the classification of Hezbollah as a terrorist organisation, jeopardising the lives of European citizens", concluded Hybášková ." With great Christian charity the man told TJP that he loves Israel (nobody needs to take what he says at face value) but refuses to criticize Ahmedinejad when he compares Israel to a cesspool and calls for its destruction. He brings even more discredit on the United Nations. "The head of the UN General Assembly claims he was slandered by "irresponsible" suggestions that he hates Israel. President Miguel d'Escoto Brockmann, an ordained Catholic priest, told The Jerusalem Post in an exclusive interview Tuesday that he loves Israel and believes the Jewish people "have suffered more perhaps in time than any other people." "I don't hate any country, but Israel I happen to love," d'Escoto said. The 75-year-old Nicaraguan, a former diplomat for the Sandinista government, has been sharply criticized in the past weeks for hugging Iranian President Mahmoud Ahmadinejad moments after he gave a speech to the UN in which he described Israel as a "cesspool." D'Escoto has also refused to condemn Ahmadinejad's comments that Israel be "wiped off the map." He told the Post he "did not like" the comments, but said he believed Iran's antipathy toward Israel stemmed not from anti-Semitism but from the political dispute over the Palestinian issue. "I don't pretend to be infallible, but I don't perceive that, for example, from Iran they would be anti-Jew," d'Escoto said. "That position of the Iranian government is on account of what they consider to be the bad treatment for the Palestinians." "He should stick to the real chores of the GA president and not give a partisan point of view," said Ambassador Daniel Carmon, chargé d'affaires at the Israeli mission. "If he is a really good friend of Israel, he would criticize a [UN] member state for making comments that another state should be wiped off the map." Ambassador Gabriela Shalev, who said in September she felt d'Escoto was an "Israel-hater," was not available for comment because of Succot. A spokeswoman for the mission said Shalev would stick by her earlier comments regarding d'Escoto. In an earlier interview with the Post, Shalev said she felt d'Escoto had "hijacked" his position as General Assembly president by using it as a bully pulpit for his personal opinions. In his opening speech to the UN in September, d'Escoto made thinly veiled attacks on the US and other permanent members of the Security Council for "casually ignoring" the will of "95% of the organization's members." Belgian newspapers have revealed that terrorist suspect Abdelkader Belliraj, a Moroccan-born Belgian citizen, was Abu Nidal's hitman in Belgium. He was the leader of a six-strong "killing cell" operating from Belgium and is suspected of having committed six murders in the country. Nidal paid him a fee of "between 200 and 300 dollars to identify and eliminate Jewish targets". Obviously for Nidal Jewish life was exceedingly cheap. Belliraj was arrested in Morocco in February with other 30 radical islamists and his trial will start tomorrow in Rabat. To complicate matters further he was also a police informant in Belgium. In his confession Belliraj admitted to having murdered 48-year old Dr Joseph Wybran, head of the immunology department at the Erasme Hospital in Brussels. As chairman of the umbrella Belgian Jewish organizations (CCOJB), he was a prominent figure, and as such easy to target. He was gunned down in the hospital parking area on October 3, 1989. Another victim was 65-year old Raoul Schouppe, a retired soldier who had opened a greengrocer's shop. Mr Schouppe was shot in the head in his shop on July 23, 1988, by Belliraj who mistakently thought he was Jewish ... because he "looked Jewish". On July 23, 1988, Belliraj struck again and killed 53-year old Marcel Bille because "he was a deviant Jewish homosexual who paid young male Moroccans from poor backgrounds in return for sexual favours". Again, Mr. Bille was not Jewish. A week before 9/11, Belliraj travelled to Afghanistan to meet Hassan el-Haski, linked to the Madrid terrorist bombings in March 2002, al-Qaida military leader Mohamed Atef, a.k.a. Abou Hafs, and was invited to a meal with Ben Laden and Ayman al-Zawahiri. He was asked to find chemical and biological weapons specialists in Belgium. "A Belgian of Moroccan origin was arrested earlier this week on suspicion of heading an important terrorist organization. The man, who lives in Evergem, had committed six murders in Belgium in the years 1986-1989, according to the Moroccan Minister of Internal Affairs. 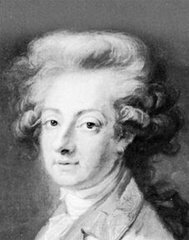 The murders had not yet been solved by the Belgian authorities. At the beginning of the week the Moroccan authorities dismantled an important terrorist organization, headed by a man with Belgian and Moroccan nationality. The man is Abdelkader Belliraj (51), who lives in Evergem, next to Ghent. According to the Moroccan minister of internal affairs Belliraj, also known as "Ilyass" and "Abdelkrim", was born in Nador in northern Morocco in 1957. According to Benmoussa he had double national and had committed six crimes in Belgium between 1986 and 1989. The offenders were never found. Benmoussa said that now that they know who had committed the murders, they will inform Belgium so that they could reopen the investigation via Interpol. According to the minister the murders were committed before the establishment of the terrorism network in 1992. The network did commit or attempted several robberies in 1992-2001 in order to finance their activities. They are responsible for the spectacular robbery of the Brinks headquarters in Luxembourg in 2000, where they netted 17.5 million euro. In 1996 the network tried to kill a Moroccan Jew and had yet planned attacks in 1992, 1996, 2002, 2004 and 2005. In house searches in Casablanca and Nador the Moroccan police found a whole weapons arsenal with Kalashnikovs, other machineguns and detonators. All together, 32 people were arrested." Le Nouvel Observateur (Oct. 9) writes that Ségolène Royal, the Socialist party candidate in the 2007 French presidential election, will be producing a joint book with Tzipi Livni, the future Prime Minister of Israel, in which both politicians will be exchanging views on a range of subjects. Ségolène Royal, who is President of the Poitou-Charentes Regional Council, has alre ady co-authored two books, one with columnist Marie-Françoise Colombani and the other with sociologist Alain Touraine. Ségolène Royal is part of a new, younger generation of European politicians who have parted company with their more cynical and calculating predecessors' ways and who are not afraid to show a keen interest and appreciation for Israel's achievements in the midst of a hostile environment. This landmark initiative by two immensely popular and able female politicians will send a clear signal that things are moving in the right direction. It will greatly improve Israel's image in Europe. Rioters in France and Israel shout "Allah Akbar"
"Allah Akbar, Allah Akbar!" and "Things will burn." "A French police officer was shot and wounded during clashes with youths that broke out after a teenager died while fleeing police, authorities said Tuesday. The officer appeared to have been shot in the leg with a hunting rifle, said the police prefecture in Romans-sur-Isère, a southeastern town located 60 miles from Lyon in the Rhône Valley on the edge of the Alps. The officer's life was not in danger. Dents from bullets and buckshot were also found in police vehicles nearby. Police used tear gas and rubber pellets to push back some 50 youths during clashes late Monday and early Tuesday. Several cars were burned and about 15 shop windows were smashed. After nightfall Tuesday, some 300 riot police officers and gendarmes took up positions around the center of town to prevent a second night of clashes. Some teams of officers were brought in from neighboring regions. The violence broke out after a 16-year-old died by driving a stolen car into a wall while fleeing police. Four other minors in the car were lightly injured. Le Monde reports (translation is general): (...) A little later the relatives came out furious from their closed-door meeting with the municipal team. In tears, a young woman told the dozens of worked up youth: "He wants to calm you down. I say to you: burn everything." This statement was met by cheers and the youth dispersed in small groups, promising the security forces a night of fire. A handful of them started shouting: "Allah Akbar, Allah Akbar!" "Things will burn," said one of the leaders of the group, surrounded by a swarm of teenagers who listened respectfully. "They're fed up with our small brothers dying in our neighborhoods. You dominated our parents. We are the third generation and we won't submit." (...) "
"Kill the Jews," "Allahu Akbar" and "If you come out of your homes, you will die." "This was a provocation. An Arab driver arrived in a Jewish neighborhood on Yom Kippur with blaring music, and refused to leave when asked to by local residents. We believe he was intoxicated. This was a deliberate act," Galilee Police spokesman Ch.-Supt. Eran Shaked said. The verbal confrontation between Jamal and the local residents quickly deteriorated into violence, as rocks and bottles were thrown at Jamal's vehicle. According to Jamal, he and his two passengers fled the car. The three were taken to hospital where they were treated for light wounds and discharged. In the meantime, police said, false rumors that Arabs were seriously harmed or killed by Jews reached the Old City, and caused a far more serious andorganized incident in Acre. Responding to the rumors, hundreds of Arabs set out from the Old City toward the Ben-Gurion neighborhood, walking down a main road, smashing store windows and cars along the way. Reports said the mob shouted "Kill the Jews," "Allahu Akbar," and "If you come out of your homes, you will die. (...)"
Pope Benedict XVI has announced that he supports the beatification of Pope Pius XII, who died 50 years ago. This is a contentious issue. Pius XII remained silent while millions of Jews (including 1.5 million children) were being exterminated by the Nazis during WWII. The Church claims that he was being "prudent". After the war, when there was no need to be "prudent", he neither condemned antisemitism nor sanctioned members of the clergy (like Bishop Hudal), who played a major role in helping former Nazis to escape trial and find a safe haven overseas, mostly in Latin America. Faced with moral dilemmas, Pius XII sadly chose to remain silent. "(...) Pius XII was also credited with having tried to stop the October 16, 1943, deportation of more than 1,090 Roman Jews, negotiating a halt to further round-ups and opening Rome's churches, convents, monasteries and the Vatican itself to Jewish refugees. "No doubt after October 16, generous, organized efforts to save Jews and others were made by all Catholic institutions in Rome," Italian Jewish historian Anna Foa said. "This could not have been done without specific orders by Pacelli." A DPA German news agency report recently estimated that more than 7,000 Roman Jews owed their lives to this activity. 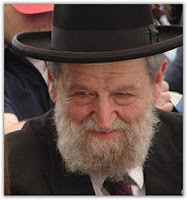 Rome Chief Rabbi Dr. Riccardo Di Segni disagreed, telling the Post that Pacelli failed to prevent the October 16 deportations from happening. Regarding Pius XII's possible beatification, Di Segni said, "On a human level, I can accept Pacelli's weaknesses, but beatification would make him an ideal for future generations. That, for me, would become an impediment to dialogue." Rosen * said, "If the Catholic Church wishes a respectful relationship with the Jewish people, sensitivity toward Jewish sensibilities is appropriate," meaning "suspension of any action [toward sainthood for Pius] as long as survivors of the Shoah are still with us." The International Jewish Committee for Inter-religious Consultations, said Rosen, "has requested full access for independent scholars to the Vatican's archives as soon as possible, thus ensuring maximal credibility." Eugene Fischer, former head of Catholic-Jewish relations at the US Conference of Catholic Bishops, speaking at Gary Krupp's Rome conference, said he agreed with Rosen. "Regarding Pius XII's beatification, as a historian, I would think it prudent to wait a few years after the opening of the archives" Pagano said. "Allowing further research and waiting can only strengthen his case. Certainly nothing negative will be found. Probably scholars will be disappointed, because there will be nothing dramatically new - although perhaps some papers indicating Pius XII's 'wishes' - rather than direct orders - might emerge." The pre-war, pre-Vatican II context of Pius's papacy may also influence evaluation of Vatican wartime actions. Catholic historians such as Alberto Melloni and Jesuit scholar Giovanni Sale admit that before Vatican II (1962-1965), anti-Semitism was very common in Catholic circles. "It was part of the environment, and people were not conscious of doing evil," Pagano said. Sale recently wrote that "the dominate mentality at that moment and in that part of the Italian Catholic world... was marked by a certain anti-Judaism... For many it was not easy to remove that mental habit and... see in the Jew an 'older brother' to love and above all, in that delicate moment, to help." "Yet very often individual priests and nuns acted courageously, exposing themselves to risks beyond the general orders received," Pagano said. "Anti-Semitism was more prominent in higher echelons, not on the people level." "In an emotional address to the European Parliament in Brussels, Ingrid Betancourt, a former Colombian presidential candidate who was freed in July after six years in captivity, spoke about others around the world incarcerated against their will, including Israeli soldier Gilad Shalit captured by Palestinians in 2006. Along with 14 other hostages, Betancourt was rescued by Colombian security forces in July after having been held a total of 2,321 days in captivity by the Revolutionary Armed Forces of Colombia (FARC), Betancourt's key message on Wednesday was one of the power of discourse; "the only weapon we can believe in, is the force of words, there is nothing stronger than words." Betancourt, who is also a French citizen, expressed her thanks to the European Parliament's efforts in creating a public consensus for her plight. She moved to remind Parliament and its audience of the continuing struggle in Colombia and those who are still incarcerated: "Parliament became aware that more than 3,000 of my countrymen are still suffering. 15 comrades and I were able to rediscover freedom and fight for the release of those others in captivity." I would like to read out their names - please indulge me for a minute. When they hear their names in this House they will respond with a speeding up of their heartbeat within the tomb of the jungle." Betancourt read the list of names with tears in her eyes. She paid also tribute to the Burmese leader Aung San Suu Kyi and Corporal Gilad Shalit, who has dual French and Israeli citizenship. Betancourt has recently launched a campaign for the release of Shalit. "People all over the world should work for the release of Gilad Shalit. If we adopt globalization for financial goals, the struggle for the release of kidnapped people should also be global," she told last month Israeli daily newspaper Yedioth Ahronoth. "If people all over the world work for Gilad Shalit's release, he will be freed," she added. "Gilad's case affects us all. I understand what Gilad's family is going through. Many people express their sympathy but cannot really understand what a kidnapped person's family goes through. It should be a comprehensive global struggle," the famous captive said." Pope Pius XII was aware of the destruction of the European Jewish population by the Nazis and their acolytes but kept silent - after the war he did not explicitly and publicly condemned anti-Semitism. The Pope did not excommunicate any Nazi criminals and was the only head of State with Adolf Hitler to have given audience to the infamous Ante Pavelic. The Holy See showed great reluctance in recognizing Israel - the mutual recognition agreement was finally signed on December 30, 1993. "At this hour, the Synod is still being led by the afternoon-long presentation of the chief rabbi of Haifa Shear-Yashuv Cohen -- the first Jewish speaker ever to address the body. Cohen said only God knows if Pius spoke out enough against the Holocaust: "God is the judge ... he knows the truth. "The Pope will celebrate a memorial Mass for his wartime predecessor in St Peter's on Thursday's anniversary. "We cannot forget the sad and painful fact of how many, including great religious leaders, didn’t raise a voice in the effort to save our brethren, but chose to keep silent and help secretly," said Cohen. "We cannot forgive and forget, and we hope you understand our pain, our sorrow," Cohen said, speaking to an audience of some 253 cardinals, archbishops and bishops, as well as Benedict XVI. Cohen called upon Catholic leaders to "raise your voice, so together with the help of free world defend, we can protect and save Israel from the hands of our enemies." "What happened once should not happen again," Cohen said. "My being here makes me feel that we can expect your help, and I am sure your message will be listened to by influential people all over the world." The third conference of the International Union of Parliamentarians for Palestine was held in Brussels on May 13, 14 and 15, 2008. The theme of the conference was Sixty Years on AL-Nakba… Sixty Years of Resistance chosen "to coincide with the commemoration of the Sixtieth Anniversary of AL-Nakba", and was attended by "a crowd of parliamentarians, ambassadors, researchers and politicians, in addition to a number of activists interested in the Palestinian cause and believers its justice". The research of the British writer Alan Hart entitled The Christian Zionism and the Secular Zionism, considering that there is a contradiction between Judaism and Zionism, which insults the Jewish principles, and is being supported by the U.S.A. financially, politically, economically and through media, calling for uniting the efforts and the ranks in order to establish an international lobby opposed to Zionism and to work on pushing it forward. Then D. Abdelmoutaleb Bouzerda presented a research entitled Zionism and racism, common mechanisms and ideological similarity. He first explained the two concepts of Racism and Zionism and linked them to the racial environment that existed in Europe. Considering that ethno-centrism is one of the problems that Europe is facing and which produced what became known as "Islamophobia". Finally he saw that in order for us to win, the Arab and Islamic communities must cooperate together in Europe and expose the link between racism in Europe and racism in Israel. As for the last research, it was presented by Mr. Luc Vervat on the behalf of the Belgian researcher Wim De Neuter (for health reasons), in which he explained the terms of the establishment of the Zionist state on the land of Palestine, stressing that this state can not be a Jewish state only because it contains Muslims and Christians, and then he reviewed the repeated Israeli attacks on Lebanon, which was confronted in July 2006 by a resistance that won. At the end he called for the need of boycotting the usurper entity by the Arab States, the European Union and the White House." Alan Hart also engaged in an "intellectual debate" with: "Italian deputies Lakobo Franye, Fernando Rossi (...) and the Iranian deputy Hassan Sheikh Al-Islam. The debate was headed by Mr. Nour Eddine Buchkoj, it focused on neo-liberalism, racism and Zionism and the peoples struggle across the world with them, and how this relates to Palestine, and to the proposed solutions to the Palestinian cause." "Dr James Bowen presented a paper entitled Is AL-Nakba systematic ethnic cleansing or not? in which he considered that ethnic cleansing was not a passing issue but it is one of the key components of the Zionist project. It has been well prepared and planned for and it is a documented issue, especially in the writings of the researcher Ilan Pappe who elaborated on the issue in his book about ethnic cleansing that the Palestinian people faced by the hand of the Jews." "Then the researcher David Morrison presented a brief research about How can the solidarity movements in the West contribute to defeat the Zionist colonial project in Palestine?, considering that despite the enormous Zionist propaganda in the West, some writers and activists intend to explain the facts to the citizens to know the truth of the Zionist settlement-oriented project in Palestine so that they increase their pressure on their governments in order to boycott this project." "Mrs. Nadine Rosa Rosso (full speech @ Sons of Malcolm (Sukant Chandan's blog)) presented a research entitled The possibility of founding a global alliance in order to support the causes of the oppressed peoples?, in which she reviewed her experience with the Belgian Workers Party, in it she confirmed that the Belgian Left does not support the American expansionist policies in Afghanistan and Iraq, stressing that we must confront the economic colonial military policies that are being implemented in several countries, and defend the Islamic identity and values in order to build a global alliance for supporting the causes of the peoples, based mainly upon the strong left, which works on supporting the causes of the oppressed peoples and opposing the American hegemony." Norman Finkelstein (who was in Brussels to attend this on May 18), Maher Al-Taher, PFLP's spokesman, and Khaled Mashaal (by video conference) also spoke at the conference. The Director General of the Union is no other than the pro-Hezbollah founder of the Arab European League (AEL) Dyab Abou Jahjah and self-styled Belgium's Malcolm X/Arab pride and official fears. "Even in a month when war raged in Georgia, Amnesty International continued to focus on the Gaza Strip, persistently blaming Israel for ongoing Palestinian hardship. Amnesty, in fact, issued harsher condemnations of Israel than of any party to the Georgian conflict. With a ceasefire holding between Israel and Hamas, resulting in a period of calm, Amnesty stubbornly continued to spew hollow publications repeating outdated allegations. Moreover, Amnesty took pride in its relentless criticism of Israel, while the rest of the world rightly concerned itself with the unfolding crisis in Georgia. In a press release, the organization boasted: "With the ceasefire holding, the suffering in Gaza has fallen off the international news agenda. However, Amnesty International members continue to campaign." This "explanation" merely highlights Amnesty's obsession with Israel, regardless of the reality on the ground. Regular readers of Amnesty’s material are not fooled by their non-stop publications condemning Israel and can easily discern that they seldom reveal anything new. Many of its press releases are identical, except for minor alterations. Amnesty’s ulterior motive appears to be to maintain a constant production rate of material denouncing Israel, regardless of actual developments. For example, Amnesty’s distasteful decision to continue issuing condemnations of Israel during a period of intense intra-Palestinian fighting clearly illustrates the point. Unsurprisingly, Amnesty failed to mention, let alone praise, Israel’s commendable acceptance of Fatah members fleeing from Hamas. While devoting so many of its resources to Gaza, at a time of acute suffering and human rights abuses in Georgia, Amnesty International failed to provide effective coverage of the Georgian conflict. Although one would reasonably expect Amnesty to immediately respond with urgency to such a crisis, raising awareness for its victims, Amnesty preferred to focus on its usual target: Israel. For instance, on August 12, 2008, the organization released a statement headlined "Trapped - collective punishment in Gaza." 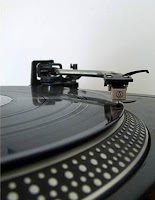 An expanded version was re-issued on August 27, 2008. As NGO Monitor analysis has demonstrated, the report lacks evidence and credibility, largely ignores the context of terrorism, exploits international legal terminology, and presents data in a highly selective and distorted manner. Concurrently, Amnesty released a series of vague and neutral statements calling on all sides of the conflict in the Caucuses to avoid harming civilians, without assuming a clear stance, nor providing comprehensive reporting on the events. Amnesty's scarce coverage of the war in Georgia is not the result of inaccessibility. Human Rights Watch managed to provide ongoing and insightful coverage, based on its delegation's observations. Such limp statements on Amnesty's part betray its commitment to the defense of every individual’s human rights. Disappointingly, Amnesty expressed less concern regarding the events in Georgia, despite the fact that a greater number of civilians were killed during that conflict than over the course of the Second Lebanon War in 2006. On that occasion, Amnesty rushed to condemn Israel in almost-daily publications. It did not hesitate to portray Israel as an aggressor and largely ignored the fact that civilians in northern Israel suffered a constant barrage of rockets launched by the Hizbullah terrorist organization. Amnesty’s lame response to the recent Georgian conflict, overshadowed by its focus on Israel, indicates that the Second Lebanon War simply served as an incentive for Amnesty to pursue its shameless Israel-bashing. Had its aversion to war been genuine, Amnesty would have responded as forcefully or even more vocally to the Georgian conflict. Were it truly concerned with the universality of human rights, Amnesty would apply the same standards to all countries. Hence, Amnesty's aim appears clear: to persistently condemn Israel, even if it means neglecting those suffering in other, more pressing conflicts across the world." Luz Gómez García is a Professor of Arabic and Islamic Studies at the Autonomous University of Madrid. This is what she teaches her students and wrote in El País on the 5th anniversary of Edward Said's death. Does she seriously believe that Israel is an apartheid State or is it just the usual provocation ? "Firstly, human geography; the settlements and the highways have intertwined the two populations to such a degree that that, save for an impossible Israeli withdrawal from all of the West Bank, any solution based on the segregation of Palestinians and Israelis would be unviable." I was rather under the impression that the actual situation on the West Bank involved a very great degree of segregation between Palestinians and settlers and far from being unviable, it is a state of affairs that has remained in place for decades now. Also, why should an Israeli withdrawal from the West Bank be impossible? If settlements can be removed from Sinai and Gaza it’s hard to see why they can’t be removed from there too. "Secondly, economic geography; the reciprocal economic dependency (Palestinian labour and Israeli territory and services) precludes the establishment of exclusive frontiers without causing massive expulsions of populations." Gómez García doesn’t seem to be aware of the extent to which Israel has reduced its dependency on Palestinian labor from the West Bank and Gaza in recent years by importing workers from other countries. Also, even if things were to revert to the pre-intifada situation when large numbers of Palestinians crossed over into Israel every day to work, this would not in itself constitute a reason for the setting up of a bi-national state, anymore than the postwar dependency of Britain on cheap labor imported from Ireland would have constituted a good reason for the abandonment of Irish independence. "Thirdly, the demographic reality; Said predicted that by the year 2010 Palestinians and Jews living in Israel-Palestine would reach demographic parity so that an apartheid system in such a small territory would be unviable in practice." I won’t rise to the provocation involved in the use of the word "apartheid" here. I’ll just say that the growing demographic weight of the Palestinians works just as easily as an argument in favor of a two state solution as a one state solution. "Finally Said argued that secular civil society in Israel was starting to examine the necessity of reconstructing the notion of citizenship on the basis of national rights rather than ethnic ones, given both the advance of the ultra-orthodox in Israel and the demands for equality of Israelis of Palestinian origin." Gómez García doesn’t seem to realize that access to Israeli citizenship is not only based on ethnicity and that possession of Israeli citizenship hasn’t put an end to discrimination against Israeli Arabs. She could, I suppose, argue that it is the possession of ID cards by Israelis identifying them as Jews or Druze or whatever that sustains discrimination in spite of the possession of equal citizenship; she could, that is, were it not for the fact that this would to go against her idea of one bi-national state. With regard to the power of the ultra-orthodox; does she really think that secular Israelis, no matter how infuriating they might find the pretensions of their observant brethren, are going to make common cause against them with the Palestinians? I’m not a fan of the one state solution in general and I like the idea of a single bi-national state even less. I can’t see that two people with such a long history of enmity and mistrust are all of a sudden going to be able to find it possible to determine their own future, as nations, inside one state. And those that like to talk about Israel today as an apartheid state and advocate a bi-national state to replace it should be careful what they wish for; an explicitly bi-national state could only be founded on the basis of the implementation of a thoroughgoing system of political apartheid." "British police arrested Gerald Fredrick Toben on Wednesday on charges of Holocaust denial. The 64-year-old Australian citizen was taken into custody upon arrival at Heathrow Airport on charges of publishing and distributing anti-Semitic material and Holocaust denial and revisionism. An EU warrant for Toben's arrest was issued by Germany authorities. He has served time in a German prison after being convicted on inciting racism. "From 2002 to this day the worldwide, internet publication of an anti-Semitic and, or, revisionist nature deliberately contrary to historical truth the said publications deny, approve or play down above all the mass murder of the Jews, planned and implemented, by the national socialist rulers," reads the warrant. In 2006 Toben traveled to Tehran to take part in the 'International Conference to Review the Global Vision of the Holocaust.' Toben told an Iranian audience that evidence of gas chambers are "the products of a feverish pathological mind filled with pure hatred, mostly directed against Germans and anything German." He maintained that those who believe in the gas chambers display "an appalling state of ignorance of natural and chemical processes"." 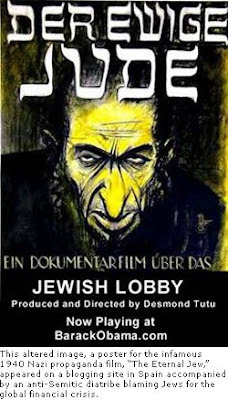 "Widely regarded as a Holocaust denier, Toben regularly denies the assertion, though he has on occasion indicated that he considers the Holocaust to be a "lie" ostensibly perpetuated by "the Holocaust Racketeers, the corpse peddlers and the Shoah Business Merchants"; he has further asserted that "the current U.S. government is influenced by world Zionist considerations to retain the survival of the European colonial, apartheid, Zionist, racist entity of Israel." While he similarly denies being an anti-Semite or a white supremacist, he is a favorite among white supremacist organizations such as StormFront, and his Adelaide Institute website has an unusual predilection for ubiquitously locating swastikas, often several per page of research or opinion." Labels: Anti-Semitism, Australia, Germany, U.K.
blond like Hitler, slender like Goering and tall like Goebbels"
Unknown artist. 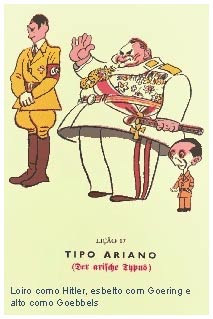 Illustrated anti-Nazi postcard distributed by the British Embassy in Lisbon during the Second World War.